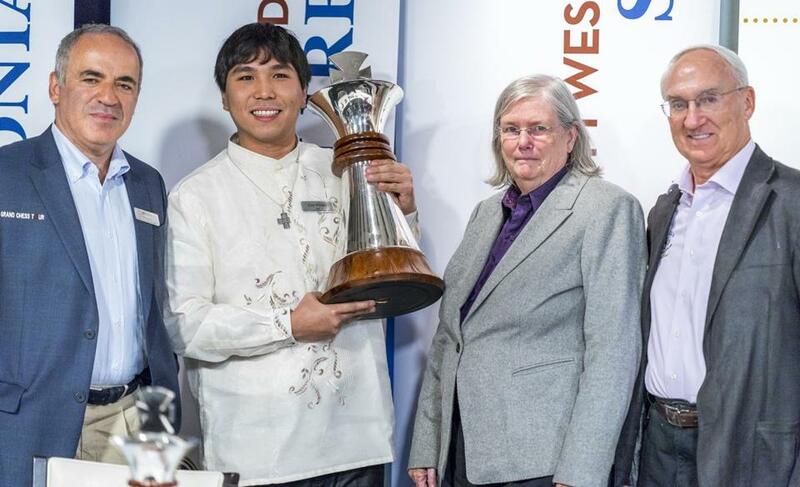 From left, Garry Kasparov, 2016 Sinquefield Cup winner Wesley So, and Jeanne and Rex Sinquefield. Rex Sinquefield is 72 years old and very much interested in chess. He retired from Dimensional Fund Advisors, the investment firm he cofounded, in 2005. Some call him a billionaire and some just a multimillionaire, but the only person who knows for sure isn’t talking. In any case, he certainly has put a lot of time, effort, and money into chess. It’s not just the money but underlying philosophy that is the most important feature of the Chess Club and Scholastic Center of Saint Louis. My visit there made it very clear that he and his staff make every effort to respect chess and those who play it. The club (www.SaintLouisChessClub.org) is a two-story building on a quiet, tree-lined street. The professionally designed interior is bright and clean. When you walk in, you are greeted by friendly staff. The basement houses a state-of-the-art media studio that is used for the Internet broadcasts of major events. The second floor is the playing room with wooden tables, boards, and pieces. Next door is the Kingside Diner, the club’s own breakfast and lunch restaurant that offers surprisingly good food at very reasonable prices. In my conversation with Sinquefield, we covered many areas. He mentioned a phone call from Garry Kasparov that got him involved with both Anatoly Karpov and Kasparov’s failed FIDE presidential campaigns and his chance meeting with Missouri chess people that sparked his nascent interest in chess. We also talked about possible expansion of the Grand Chess Tour to six events and his ongoing, chess battle with 6 year old Rachael Li of Texas. He shows great concern about even smallest detail at the club, even making sure that the pieces are clean. He’s even is thinking of having expensive DGT boards throughout the club to make sure that players would always have scores of their games. There is nagging question of sustainability, but for now, there has never been such a place for chess in America. The weekly problem is not running today. Chris Chase can be reached at BostonGlobeChessNotes@gmail.com.